DigitasLBi North America has been awarded the Cannes Lions Pharma Grand Prix for Integrated Digital Campaign for the “Take it from a Fish” campaign for AstraZeneca. The campaign was also honored with a Silver Lion for ‘Direct and Promo Activation’, a Bronze Lion for its related film, and was shortlisted in four categories. 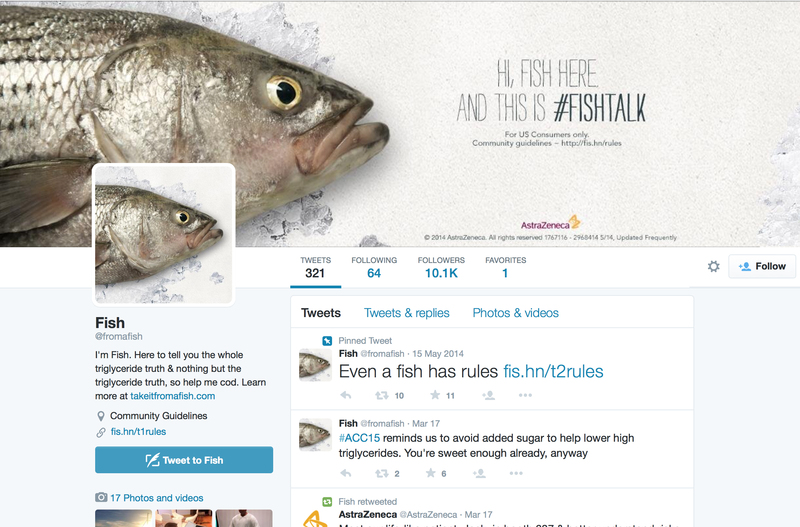 The “Take it from a Fish” campaign was designed to educate men with high triglycerides. To tackle the challenge, DigitasLBi created an integrated online and social campaign designed to entertain and inform. 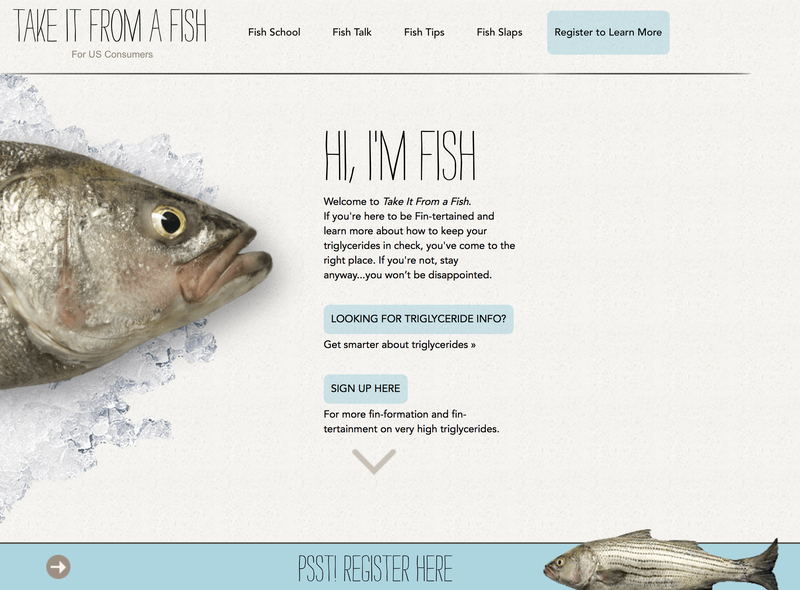 Takeitfromafish.com introduced Marty and Sal, two “spokesfish”, to the target — and his wife and adult children — through entertaining original videos and content to be shared socially. The campaign was activated via Twitter (@fromafish), YouTube and Pinterest, generating some of the highest engagement in the pharma category. YouTube video completions increased 100% over pharma benchmarks, and the work is one of the top five performing Twitter campaigns ever in the category. “Winning a Grand Prix is the ultimate accolade, and we’re humbled by this recognition from the prestigious Cannes jury,” says Ronald Ng, Chief Creative Officer, DigitasLBi North America. “We’re always pushing the limits to tell great stories for our clients, and we’re grateful to them for being such passionate and collaborative partners. In this opening episode, Sal and Marty talk about the important things in life, like love and triglycerides. Sal and Marty are back in episode 2, talking about how diet could help keep triglycerides down. But Marty takes it a step further, as he ponders the nuances of the English language. In episode 4 a touching heart-to-heart moment about diet and triglycerides between Sal and Marty goes sideways quickly when loyalties are tested. Further episode 5 to 11 are “Next Film”, “Knock-Knock”, “Spanish Mackerel” (featuring new character Consuela), “Cantaloupe”, “Ice Dude”, “Talk Show”, and “Half Off”. The Take It From A Fish campaign was developed at DigitasLBi New York, by group creative director Carlos Ricque, creative Mark Musto, creative strategists Carla Wilke and Brian Sherwell, group account directors Krista Bowman and Sarine Marangosian working with Astrozeneca marketing team Kristen Bucklen and Rosann Fisher. Filming was produced at Nice Shoes by director and creative director Harry Dorrington, executive producer Geraint Owen and producer Nancy Giandomenico. Post production, CG and compositing was done at DigitalKraft by VFX supervisor Ivan Pribicevic, and post production crew Ivan Arsic, Aleksandar Djordjevic, Ana Pakljanac, Ivan Milovanovic and Ada Sokolovic, with Nice Shoes VFX supervisor Harry Dorrington.